When was the last time you enjoyed a film for its gripping plot, its compelling story? Drishyam, with its refreshingly original screenplay and its many moments of tension, is just that. Kamat’s Hindi version pales in comparison to both the original Malayalam film and the Tamil remake, but the plot nevertheless keeps you hooked till the end. I’m going with three-and-a-half out of five. Now forget everything you just read and go watch the film. Director Nishikant Kamat maintains the grip right till the last sequence. #Drishyam is an absolute WINNER. Keeps you hooked. Don’t miss it! Drishyam has a POWERFUL plot that’s embellished with BRAVURA performances: Ajay, Tabu, Shriya, Ishita, Rajat Kapoor, every actor triumphs. This is the best phase. Baahubali, BajrangiBhaijaan. Now Drishyam, which I just watched and feel it’s simply INCREDIBLE. Brilliant film! On the whole, Drishyam is a well-made film with some exciting moments but it has appeal more for the classes. It is also too lenghty. At the box-office, it will be difficult for the film to break even. while I haven’t watched any of the other Drishyams or read Suspect X, this Hindi version is an utterly unremarkable thriller, one that could have been potentially cool and wily, but one that falls well short of being memorable. It’s a depressingly ordinary film, and the allegedly stolen plot — about a crime being covered-up — is something we’ve seen many, many times before. The film, which stays mostly faithful to the original but has a few inserts, could have been better if it had been tighter.Finally, though, the film holds. In the way it unravels for us the street-smartness of a near-illiterate man intent on protecting his family at any cost, and how forgiveness can, sometimes, lead to a kind of acceptance. And in the way it delivers the stinging twist to the tale. Drishyam, a thriller that eschews the standard trappings of the suspense genre, is replete with surprises. That, however, is true only if you haven’t seen any of the four southern versions of the film, especially the recently released one in Tamil – Papanasam, starring Kamal Haasan in full flight.Drishyam is gripping in parts but is anything but an unblemished humdinger. A suspense drama with a nail-biting finish, Drishyam holds the viewer by the eyeballs till its’ engaging climax.Ajay, who is the prey here, shines in his role of the protective father. While his family definitely needed to be cast in a more discerning fashion, half a star in this review is reserved for Tabu, who is outstanding as his predator. Drishyam works because it doesn’t talk about a hero but a common man. Drishyam works because you feel for every character in the film. Drishyam works because it leaves you stunned. Drishyam works because it keeps you glued to your seat till the last moment. 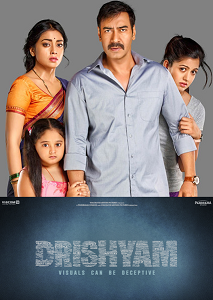 Drishyam works because it’s a finely crafted suspense thriller after a really long time. Patchy, forced humor that plays to the gallery strikes out of tune notes in a powerful script. The biggest flaw of ‘Drishyam’ is it’s unidirectional treatment- a story that hinges on the conflict of truth versus lie hardly ever evolves. It’s almost like the skeleton of a masterpiece has been hastily pulled out & cast for a populist product.But do watch this film for Ajay and Tabu’s performances and of course, that one-in-a-million story. Content, after all, is the key. There is no single moment in the film suffers a lag. As far as the film’s cinematography (Avinash Arun) is concerned, the camera work takes you on a trip of its own…simple frames but the requisite lighting and the changing camera angles add to the mystery. As for the taut screenplay (Upendra Sidhye), it keeps on playing with your mind all the time. You know what happened but even then you are taken for a ride and you start believing in it. On the whole, DRISHYAM is an absolute winner that keeps you hooked completely right till the end. It is definitely a must watch movie this weekend. Synopsis: Masaan, a Vijay Salgaonkar (Ajay Devgn) runs a cable TV network in a remote and hilly village of Goa. He lives a happy life with his wife Nandini and two daughters. A 4th grade dropout & an orphan, Vijay has worked his way towards success with his sheer hard-work & street smartness in order to provide for his family who mean the world to him. A man of few means & needs; Vijay believes life is to be lived simplistically – his wife, while she loves him devoutly, wants Vijay’s thrifty & miserly behavior to end and wants the world for her family.